Teensy 3.2 is a direct, 100% compatible replacement for Teensy 3.1. It is fully compatible with all shields and add-on boards made for Teensy 3.1. The Teensy USB Development Board is a complete USB-based microcontoller development system. All programming is done via the USB port. No special programmer is needed, only a standard USB micro cable and a PC or Macintosh with a USB port. 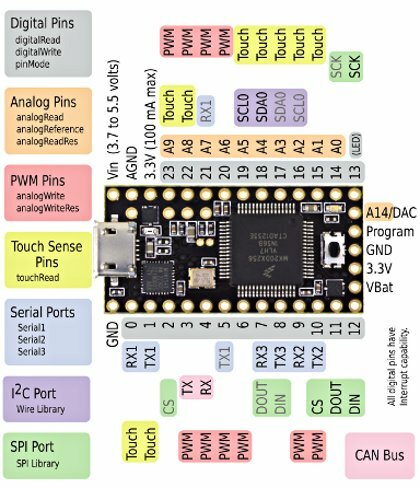 Version 3.2 features a 32 bit ARM processor and is compatible with code written for the Teensy 3.0. Version 3.2 has quadrupled RAM compared to v3.0 and has 5V tolerant digital I/O pins. The Teensy 3.2 also features a 12bit analog output, two ADCs and a CAN bus controller. You can find all the details about what has changed in v3.2 here. The very special thing about the Teensy boards is that they are able to emulate almost any USB device (USB HID), i.e. mouse, keyboard, joystick, MIDI etc. This version has solder pads for all I/O signals. The Teensy Loader makes getting code into your Teensy easy. Just press and release the reboot button and the processor runs the HalfKay bootloader, which is automatically detected. Teensy Loader lets you download your code and reboot to it. Automatic mode downloads and reboots to your code the instant your computer detects HalfKay. The latest version of your code is always used. Just press the button and within 1 to 2 seconds your latest code is running!